Who would ever think that a simple chicken tender tossed in a sauce could be one of the most tasty things ever? A piece of chicken breast, lightly breaded, fried and tossed in a wing sauce. That’s it. As simple as that. A few simple steps to create one of the tastiest things I have ever had. This is all that it takes to produce Zingers served up at Miller’s Ale House. And wow, they sure are tasty. While I had seen Zingers listed on the Ale House menu, I first discovered Zingers via Taylor. When we visited Ale House (many, many years ago), Taylor would order the Zinger Mountain Melt. This consists of Zingers on top of an order of loaded fries. Taylor likes to order his Zingers with Mild Wing Sauce and I really just don’t care for this sauce. So, I never thought about it and stuck with my order of fish tacos while visiting Ale House. Then one night, I decided to try something different. After further review of the menu, I found that one of the available sauce options for Zingers was honey mustard. Ahh. It was time to try these. 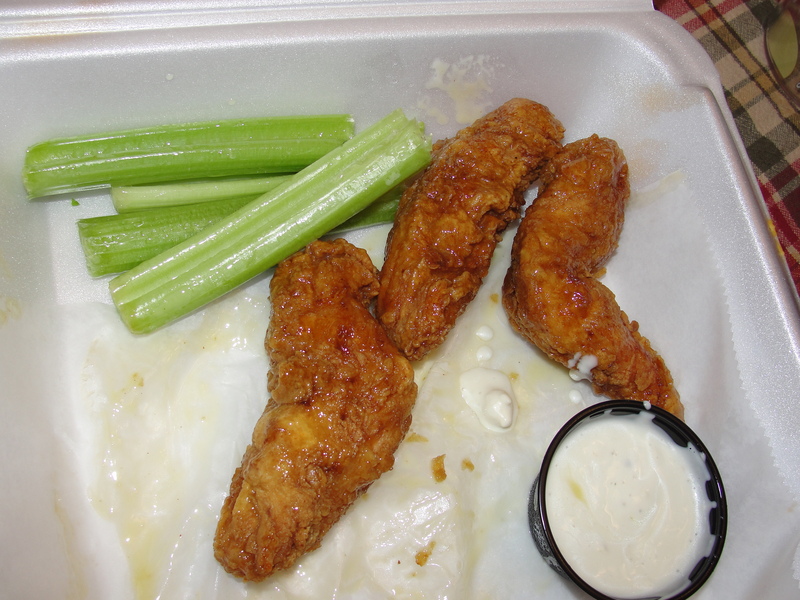 The Zingers are served with your choice of either blue cheese or ranch dressing. I always opt for mine to be served with blue cheese dressing. The number of Zingers you receive in each order vary. I have received orders of 6 Zingers and orders of 9 Zingers – it always varies. The chicken in these Zingers is all white meat and is so moist. The chicken is not seasoned with anything and relies purely on cooking and the tossing of sauce to provide all flavor. Each piece of chicken is a fairly good size in both length and width. The chicken is so juicy and the consistency is simply perfect. I really appreciate the fact that these Zingers are served with barely any breading. Unlike your typical chicken fingers (bit of chicken and tons of breading), these Zingers are chicken with just a light coating of breading. The breading is simple and not overly fried. While the breading is not overly crunchy, there is a slight bit of crunch provided. It works well with the moist interior of the Zingers. There is not one particular flavor that stands out with the breading but, this is really because of the fabulous sauce they are tossed in. Once these chicken tenders are tossed with honey mustard, they become Zingers. The honey mustard is really what sets these Zingers apart. What brings them from good to fantastic. The honey mustard used is a thicker honey mustard sauce and is not too sweet. The honey mustard sauce sticks perfectly to the breading. While they are coated in honey mustard, they are not dripping in it. When you pick up the Zinger and bite into it, the honey mustard meshes with the breading and chicken. The result – love. Every bite provides ample amounts of chicken, breading and honey mustard. Once you dip these Zingers into the blue cheese dressing, oh my. They go up another level all together. Blissful. Just a small bit of blue cheese is needed to really amp up the Zingers. The blue cheese is basic and is really not too strong. This allows the Zingers to do all the work and the blue cheese to be a great sidekick. Also, the coolness of the blue cheese in combination with the very warm Zingers, provides a lovely mesh of temperatures. I find more and more often that I really enjoy this mesh of temps. Even though I don’t order Honey Mustard Zingers every time I visit Ale House, I do always think about them. I also really enjoy the Honey Mustard Zinger Tacos – with the Zingers being the star component. I normally am not a huge chicken tender fan but the Honey Mustard Zingers are just something special. Everything about them, but really the simplicity of them, makes them just so amazing. 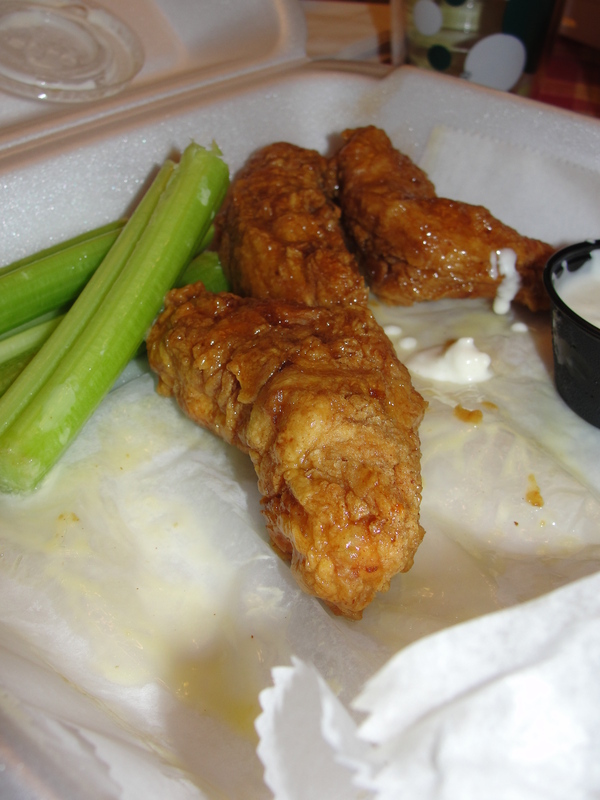 If you live close to an Ale House (and haven’t yet tried Zingers), go and get yourself an order. For under $10 you are going to have a great meal & overall experience. When you use good, moist chicken, simple breading and a honey mustard sauce that’s killer, the result is Zinging Love.